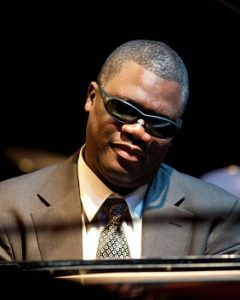 Saturday, May 4, at 8 p.m.
Marcus Roberts began teaching himself piano after losing his vision at age 5 to glaucoma and cataracts. By 21, he was touring with Wynton Marsalis, who has called him “the genius of the modern piano.” Since then, he has built his reputation as a composer, arranger, bandleader, and educator, still drawing his inspiration from traditional jazz, swing, ragtime, and blues music. The Modern Jazz Generation is a 13-piece ensemble anchored by Roberts and his regular trio bandmates: drummer Jason Marsalis and bassist Rodney Jordan. Roberts formed the group in 2013 to carry on the jazz tradition of older musicians mentoring younger players.